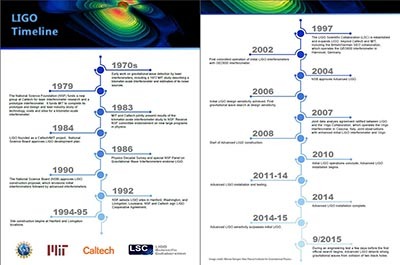 We at NSF are celebrating the Laser Interferometer Gravitational-wave Observatory (LIGO) for the first direct detection of a gravitational wave, resulting, remarkably, from the collision and merger of two black holes approximately 1.3 billion years ago. It has taken that long for the signal to propagate to the detectors in Livingston, Louisiana, and Hanford, Washington, and produce a 100 ms transient that opens a new window on the universe. Most readers of this blog know the story, and I will not repeat it here. The excellent article in the New York Times, the blog post from the White House by the President's science advisor, John Holdren, and NSF Director France Córdova's commentary in U.S. News and World Report are just a few write-ups that capture the excitement of the news. Dr. Córdova led and moderated the press conference and has persuasively articulated NSF's role in LIGO's past, present and future in many different venues. I want to focus on how the National Science Foundation has supported gravitational physics research, the direct antecedents of this discovery, and the construction of LIGO over approximately 40 years, as this timeline shows. It is a long journey, accomplished by intellectual prowess and hard work, the genius of many scientists, and the wisdom of dedicated NSF program officers who nurtured LIGO over those years. Among those attending the announcement of the discovery were three of my predecessors as assistant director for mathematical and physical sciences: Bob Eisenstein, Michael Turner, and Ed Seidel, each of whom dedicated much effort, thought, and enthusiasm to LIGO. Beginning with his time as the physics division director, Bob was key to building LIGO and deserves particular credit for leading the foundation to support this remarkable project. The National Science Board and the NSF directors have carefully watched and supported this daring effort over the years. There is a long story of twists, turns and challenges met. From the time that Marcel Bardon, as division director, established the gravitational physics program, the physics division in MPS has supported gravitational physics. It funded LIGO's develop-ment and oversaw the Major Research Equipment and Facilities Construction (MREFC) projects that built Initial LIGO and Advanced LIGO. (I use these terms to distinguish the two separate MREFC projects that brought us to today's observatory.) It then funded the operation and maintenance of LIGO along with investments that produced the remarkable technological advances at the heart of Advanced LIGO. The Foundation devoted almost $480 million to constructing LIGO and a total of about $1.1 billion to all aspects of the project. Significantly, LIGO was the first project to use MREFC funding, launching an approach that has become our mechanism for building very large experiments. Since NSB approval of construction in 1990, seven NSF directors, nine NSB chairs, over 80 NSB members, four physics division directors, and six physics program officers have watched over this project. We owe particular credit, praise and gratitude to the program officers who have shepherded LIGO through its two construction phases. Over the years, Richard Isaacson, David Berley, Victor Cook, Tom Lucatorto, Thomas Carruthers, Beverly Berger and Mark Coles have been in the trenches at NSF, understanding the physics and the technology while providing continuity and supporting the science and technology of this remarkable instrument. (Mark Coles, the current LIGO program officer, gets a double nod as he served as the observatory chief for LIGO Livingston before coming to NSF.) The other key player today is Pedro Marronetti, who leads NSF's gravitational physics program. Program officers are at the heart of NSF's work, and the excitement of the first direct observation of a gravitational wave is an opportunity to underline their critical roles. Many remarkable individuals from around the world created this triumph, but the stars of NSF's work here are our program officers. This discovery is an opportunity to highlight the ones who have championed LIGO and to point to the program officers all around the foundation who bring the same dedication, insight and wisdom to our mission every day. We are grateful and indebted to them all. Finally, I want to point out that the search we are celebrating did not have to come out this way. The scientific community and NSF were betting that the newly dedicated instrument would detect gravitational waves, but there would have been new insights even if it did not. Because of the extraordinary sensitivity of the instrument, the absence of an observation would have constrained our models of the universe and our understanding of gravity. It is much more exciting to observe gravitational waves and, winning the bet, open up a new era of observation. This measurement marks the beginning of gravitational-wave astronomy. The fortitude to take the risk of building a major instrument that potentially transforms our view of the universe is our strong suit, and the foundation serves the nation when it makes those bets. The observation of gravitational waves is a triumph of fundamental science. Accomplishing it has pushed the technology of mirror fabrication and coating as well as achieved wonders of vibration isolation. Such developments are already having practical consequences, but even these early rewards are only a first glimpse of things to come. I was struck by comments posted to the New York Times website and will paraphrase one from "Mike S." He says this discovery is unlikely to transform your life in the short run, but he can guarantee that failure to invest in science with no immediate application will change your children's lives dramatically.